Celebrating St David’s Day in style, and raising money for a great cause, Lloyds Bank colleagues from branches across Wales raised £8170, for the Group’s charity of the year¹ BBC Children in Need. From Friday 27th February to Monday 2nd March, colleagues from around Wales celebrated St David’s day by adding a dash of the Welsh colours into their usually plain green uniform and decorated branches with traditional colours, flags and daffodils, to give customers an authentic St David’s day experience. 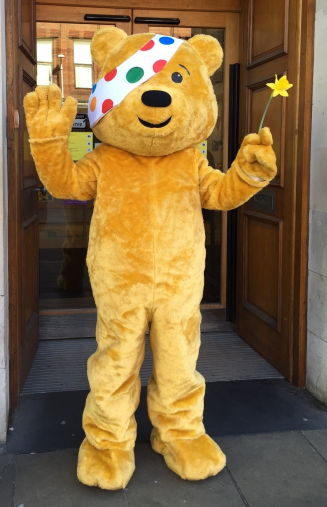 As part of the celebrations, the Bank raised money for BBC Children in Need, its Charity of the Year for 2015 and 2016. Colleagues used their creativity to encourage donations, with many selling homemade Welsh cakes, running “colour the flag” competitions and inviting local choirs into the branch to complete the St David’s Day feel. In three of the branches, BBC Children In Need icon, Pudsey, joined the festivities to help bring the events to life. In total, an amazing £8170 was raised across the branches. BBC Children in Need works across the UK to ensure that every child has a safe, happy and secure childhood, with the chance to reach their full potential. Through nationwide fundraising, including the annual televised appeal, it provide grants to benefit disadvantaged children and young people of all backgrounds, including those who face disability, bereavement, illness, poverty and neglect. At present, BBC Children in Need funds more than 140 organisations working in Wales.